Over the past 20 years, we have established an excellent reputation for creating masterpieces of architecture and interior works, conquering the hearts of the world's most sophisticated connoisseurs of luxury interior designs. Luxury Antonovich Design currently provides design and architecture services in the Middle East, USA, Nigeria and Shanghai. The company's headquarters are in Dubai, Miami and Los Angeles. Reflecting the grandeur of the Arabian palaces and narrating the sophistication of the modern architecture, each unique design that we create becomes a gem of the city's skyline. The reputation we’ve built and the position we’ve earned reflects our passion for creativity and superior edge that we stand on, likewise our capability to conceptualize the perfect luxury interior styles and exteriors that we’re known for. We understand the value of each landscape, therefore inculcating the power of urban landscaping and excellence through our great architectural expertise. 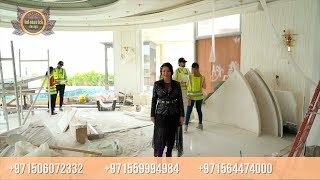 Believing in the art of luxury, our exquisite interior design in Dubai, Abu Dhabi and Sharjah is uniquely delivered at the highest level, where affluence and comfort are built to the absolute value. Our exclusive royal residences, opulence apartments, beautiful penthouses, elite villas and palace complexes reflect the level of 9 stars, which can only be accomplished with an expert interior designer and seen in the wonderful city that is Dubai. The architectural masterpiece by Luxury Antonovich Design purposefully combines our cutting edge technology with attention to detail craftsmanship. We’re acknowledged for delivering the highest standard of architecture and interior design styles in UAE in the finest form of luxury, comfort, and grandeur. Thus, we’re a team of highly-experienced creative consultants specializing in 3D interior design in Dubai, with diverse disciplines. We are immensely proud of our accomplishments and humbled by the incredible opportunities assigned to us by our respectable clients around the world. Architectural design is the process of developing a prototype of the future object. It plays an important role in the construction of any object: a residential house, a public building or an industrial building. This is a difficult, time-consuming and at the same time creative work. The team of architects of Interior Design Company Dubai develops exclusive and unique luxury projects. Authors’ methods of creation and organizing the place are successfully implemented in all directions of construction and architecture. Commercial buildings (office, shopping center, gym, beauty salon, restaurant). Architectural supervision and technical supervision directly during construction work. Engineers, responsible for special work. Read more about our team: About us. The recognizable style of our architectural team is bright and modern architecture. Luxury Antonovich Design Company is the best Dubai fit out companies, which provides comprehensive services for the construction of houses "turnkey". As part of the construction or as a separate service, you can order a fit out service of a house, apartment, cottage, restaurant or office. The list of services of our fitout company in Dubai will be incomplete without such services as fit out. This is an extremely important stage of construction work. Qualified masters of Dubai Interior Design Company perform high-level of finishing and fit out works. We own all innovative and traditional technologies, work in compliance with building codes and fire prevention rules on the basis of technical and architectural documentation and a contract. The task of the Interior Fit Out Company Dubai specialists is to make the house individual, corresponding to the needs and requirements of the customer, cozy, warm and comfortable. We give a guarantee for all our fit out works and precisely observe deadlines. The combination of such advantages makes the option of cooperation with Luxury Antonovich Design most attractive. We have all the necessary conditions for high-quality fit out works of any complexity. Our author's supervision in the design, construction business is an integrated control measure designed to bring stylistic, technical, architectural and other parties into absolute conformity with the design documentation, which is approved by the customer. The author's supervision of the design of the project and other stages are implemented directly by the developer, who is well aware of all the features of his calculations. In other words, the author will be able to fully monitor the compliance of the developed scheme directly on the construction site. What constitutes the supervision that our author design company proposes to create and agree on a list of materials; signing an agreement for the supply of goods; selection of materials, compilation of the accompanying specification; visiting the client of construction centers, accompanied by our specialist; confirmation and payment for purchases required by author's design; delivery of purchased materials within the specified deadlines; full quality assurance. Luxury Antonovich Design is the Company licensed to use consulting and engineering businesses in Dubai, according to the engineering consultancy activities accredited by the Registration and Licensing Committee to practice Consulting Engineering & Contracting professions In Dubai. Luxury Antonovich Design is a brand that specializes in hotel solutions, undertaking outstanding residential projects in both classic and contemporary styles. Starting from the design stage and then in the course of production up to installation and delivery, our specialists assumes the duty to coordinate and supervise all operation at any stage, taking accurate control on the exact execution of the order. The expertise gained in the 5 * and luxury hospitality sector allows us to provide the customers with an exceptional choice of style solutions, exclusive materials and custommade finishes for the manufacturing and the installation of the projects. Our professional interior designers in Dubai deliver the highest standards of architecture and creative masterpieces. Supply of furniture, chandeliers, decor elements and finish materials. We offer our clients a sale of luxury furniture and exclusive interior decoration. You can buy furniture of the world`s best factories in studio Luxury Antonovich Design! The full catalogs of prime collections are represented at our office! We create expensive furniture for top-of-class interiors due to the drawings of our designers. Own production in Italy and Turkey allows us to create luxury furniture of the highest quality in a short time. Design studio Dubai Interior Company is a reliable partner in the supply of furniture, decor elements, chandeliers, construction and finishing materials. We offer our customers the organization of deliveries of the best materials and furniture directly from the leading manufacturers of Italy and other countries. High-end curtains from Design Interior Company are the masterpieces which subtle masters of their craft create for you, real specialists who masterfully possess both modern technology and techniques of manual work. Top-class professionals perform curtains sewing using Japanese equipment at their factory in Astana. We execute orders of any complexity, including the departure to measurements, drawings, sewing of the high-end curtains and installation at the site. That is why our products are obtained so luxuriously and flawless.We cooperate directly with the largest leading factories in the production of fabrics and accessories. Designs and the Architectural masterpiece from Elite Luxury are the beautiful arts of elite residential and commercial projects. We fulfill the dreams of a comfortable living! Luxury Antonovich corporate group is a group of companies engaged in providing a full spectrum of services in turnkey interior architecture and design for residential and commercial clients. Luxury Antonovich Group as an international company, including Luxury Antonovich Design in Miami and Luxury Antonovich Home in Dubai, provides a bespoke design services in the UAE, USA and Africa. Our talented team of creative, skilled and dedicated professionals handles every client’s requirements and preferences on an individual basis delivering highly effective project solutions.